Emily Post was an American author who is most famous for her writings on etiquette. 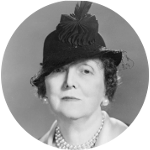 She is the founder of The Emily Post Institute which continues to promote etiquette and civility in America and around the world. Emily Posts's great-grandchildren Peggy Post and Peter Post have continued the tradition of writing about etiquette having authored a number books and articles about the subject. Emily Posts's father was architect Bruce Price. One of Bruce's most notable accomplishments was being the architect who designed Quebec's famous Château Frontenac. Andrew Lee, a 2nd great-grandfather of Emily Post, is said to have been a member of the infamous Paxtang Boys. The Paxtang Boys were a group of Scotch-Irish militants who massacred a group of Conestoga Indians in 1763. A 3rd great-grandfather of Emily Post named Lazarus Stewart was said to be one of the leaders of the Paxtang Boys. Iroquois Indians would later exact revenge when Lazarus Stewart was killed in the Wyoming massacre. The massacre occurred when loyalists accompanied by Iroquois warriors killed over 300 American patriots on July 3, 1778, in the Wyoming Valley in Pennsylvania. Some of the survivors claimed that the Indians hunted down fleeing patriots and tortured to death up to forty patriots who had surrendered. Emily Post was a descendant of Mayflower passenger John Alden. She also has a number of famous family connections through John Alden including both U.S. Presidents John Adams and his son John Quincy Adams. Her family relationships to fellow authors include Francis Scott Key (“The Star Spangled Banner”), F. Scott Fitzgerald (The Great Gatsby), and Ernest Hemingway (The Sun Also Rises). One of Emily Posts's great-grandfathers was Colonel Josiah Price. He was a veteran of the American Revolution and he married Jane Scott. Josiah's father was said to have come from Wales and settled in Pennsylvania just north of the Maryland border in an area called Welsh Run. I have not been able to identify either the father of Josiah Price or the father of his wife Jane Scott. In Laura Claridge's 2008 biography Emily Post: Daughter of the Gilded Age, Mistress of American Manners she brings up the family connection to Francis Scott Key, author of the U.S. national anthem The Star Spangled Banner. Ms. Claridge mentions on page 7 that Emily's paternal grandmother Marian (Bruce) Post was a first cousin to Francis Scott Key. Just a few pages later on page 16 Ms. Claridge makes a reference to Bruce Price, the father of Emily and son of Marian, as a descendant of Francis Scott Key. This latter statement cannot possibly be true as Bruce Price's parents would have been contemporaries of Francis Scott Key. The truth is that Bruce Price is neither a descendant of Francis Scott Key nor is his mother Marian (Bruce) Price a first cousin. Marian is a second cousin of Francis Scott Key. This would make Bruce Price a second cousin one time removed, and Emily Post a second cousin two times removed. Ms. Claridge may have been steered wrong by the will of Charles Key Bruce, brother of Marian. In his will he makes a bequest to “my cousin Francis Scott Key”. What Charles left out of the will was that Francis Scott Key was his second cousin and not first cousin.